What Exactly is Wrong With the Philadelphia Flyers? What is wrong with the Philadelphia Flyers can be summed up in one word: everything. The Flyers have been out coached, out played and out hustled by the New Jersey Devils, who now hold a 3-1 series lead and have Philadelphia on the brink of elimination. So what exactly happened to the team we saw in the first round against the Pittsburgh Penguins? The first round was a completely different matchup for Philadelphia, one that involved a more run-and-gun style of hockey which offered little emphasis on a defensive-style game. The Flyers needed no motivation battling their cross-state rivals, especially considering how the regular season ended. After the series finished, it was as though the Flyers thought the Penguins were the only team keeping them from hoisting Lord Stanley’s cup. And since the orange and black beat Pittsburgh, the odds-on favorite to win the cup, it should just be given to them. But the Devils have other plans. The rivalry with the Devils isn’t nearly as heated and it appears as though the Flyers are taking New Jersey way too lightly. The Devils have had no trouble getting amped for their games and it just seems like they want it more. Coach Peter DeBoer has his team playing a disciplined, high energy game, taking a page out of the Flyers’ first round book and using it against them. 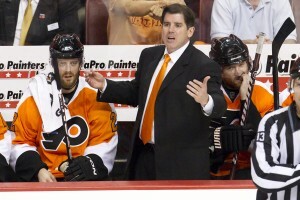 While DeBoer is pushing all the right buttons, Flyers coach Peter Laviolette is not. Laviolette has been out-coached for much of the series, with poor preparation and poorly used timeouts, which is unusual considering Laviolette has become legendary for his timeouts. The Flyers have come out strong in each of the four games thus far but have managed to run out of gas after scoring an early goal or two, disappearing for the next 50 minutes and relying completely on goaltender Ilya Bryzgalov. Bryzgalov has been the one bright spot for Philadelphia in the series. Sure he has let in a few soft goals that he would like to have back, but he has made plenty of big saves, keeping the Flyers in games while facing a barrage of shots. Laviolette had an extra day to plan for Sunday’s game in New Jersey and it seemed to pay off when the Flyers took an early 2-0 lead just under 14 minutes into the contest. From that point it was all Devils, out-shooting the Flyers 43-22 including a second period in which Philadelphia didn’t register a shot until almost the halfway point. They went on to win 4-2 and deserve plenty of credit for how effectively they adjusted their game after giving up early goals, something the Devils have done all series. The Devils have taken away the neutral zone by attacking the Flyers rather than sitting back. To complement their neutral zone play, the Devils are quick to the puck and winning the battles along the boards. In the offensive zone, they have managed to cycle the puck with precision, forcing the Flyers’ defense to constantly remain on the move, tiring them out. The defense has played poorly for the Flyers and while Braydon Coburn has played well and logged the most minutes, Kimmo Timonen has not looked like his usual self. Timonen’s ice time is down, averaging less than 20 minutes per game in this series, leaving us wondering if the 37-year-old is battling some sort of serious injury. The biggest strength for the Flyers coming into the series was their power play, which produced 12 goals─a franchise record. But the Devils are a much better penalty killing team than the Penguins. Not only did New Jersey have the best penalty kill in the league this season, but the best penalty kill in NHL history, killing off 90.1 percent of their oppositions’ power plays and allowing just 27 goals. Through the first four games of the series, the Flyers have scored just three times on the man advantage. Those three goals have not come at key moments, however. In game three the Flyers received two power plays in overtime but were unable to set anything up. The Devils fought it off, giving the team momentum that lead to an eventual game-winning goal from Alexei Ponikarovsky. The Flyers simply are not playing to their strengths. It’s clear they are a deep scoring team that can not only out-skate, but out-hit almost any team in the league. Instead, they’re playing right into the Devils’ scheme which has them looking like the New Jersey Devils of the late 1990s. It’s all but over for Philadelphia unless the Flyers can put together a comeback of epic proportions much like they did two seasons ago in the second round, winning four straight against the Boston Bruins with their backs against the wall. The Devils surely won’t take the Flyers lightly, as they were in the same spot back in 2000 against the Flyers, down 3-1 in the Eastern Conference Finals, until one big hit turned the series around and New Jersey went on to win the cup.